The new offer, which values Sky at £26bn, trumped an earlier bid from Rupert Murdoch's 21st Century Fox. Comcast said it had "long admired Sky", adding: "We believe it is an outstanding company and a great fit. Today's announcement further underscores Comcast's belief and its commitment to owning Sky." Comcast said its sweetened offer has been recommended by Sky's independent committee of directors. Rupert Murdoch's Fox has been waiting for approval from UK authorities before putting its offer to Sky shareholders. Comcast gatecrashed Mr Murdoch's attempt to buy the 61% of Sky his company did not already own in February while the Fox deal awaited government approval. 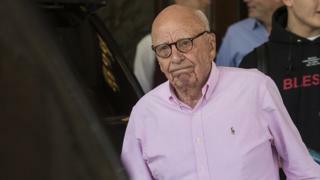 Hong Kong-based hedge fund Case Equity Partners, which has a stake in Sky, said the fact Disney was in a slightly more favourable position for Fox's US media assets meant that Comcast would fight even harder to win Sky. "We see a final Sky deal outcome at well over £15 per share," said managing partner Michael Wegener.